Vintage 1960s large tray in Mutenye designed by Jens Quistgaard. Produced by Dansk in Denmark. Marked. 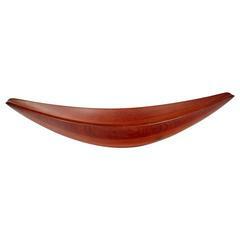 Danish 1950s staved teak canoe bowl designed by Jens Quistgaard for Dansk. Marked. Vintage Danish staved teak wood handled ice bucket designed by Jens Quistgaard, circa 1950s. Marked underneath. Vintage floral sterling silver and mahogany wood round serving trivet. Marked Sterling. A large scaled, rare and reversible mutenye serving tray with expressive inset butterflies. Vintage staved decorative tray #803 designed by Jens Quistgaard for Dansk. 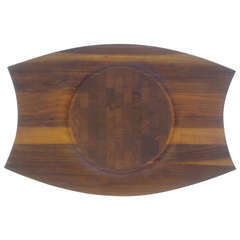 This early designed piece is the larger version and is made of solid planked teak. A three-compartment palisander tray with concave sides and inset “butterfly” splines. Early Dansk duck logo JHQ staved teak Danmark 803 stamp .Very nice basically un touched condition. 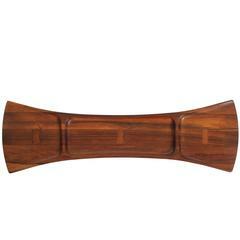 Mutenye tray by Jens Quistgaard for Dansk. From the Rare Woods collection. Denmark, circa 1960. Signed.